Think of us as your creative partner. Whether you're looking to launch or refresh your brand, need ongoing marketing help, or just need a new responsive (mobile-friendly) website, we're here to help. We are a multi-dimensional team of creatives with a combined 30+ years of branding, design, marketing, and sales experience working for and with companies big and small throughout the US. With every project, whether we've been working together for 10 years or 10 days, we take the time to ask questions and learn about your vision and needs before coming up with any ideas. This information helps us plan the project and develop the strategy that will ensure whatever we're producing for you meets your objectives and is successful. 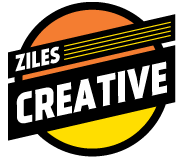 When Ziles Creative says they are 'Your Creative Partner', they truly mean it. They are fully invested in the success of your company's branding and marketing initiatives. The Ziles Creative team really took the time to genuinely understand our marketing needs [at Intelica CRE] and how they could help us better serve our clients and market our services. We are extremely impressed and pleased with the results of our rebranding campaign. We have received countless compliments on our new corporate look. We would highly recommend Ziles Creative to any company in need of a fresh new marketing look and/or campaign. Our clients enjoy working with fellow entreprenuers that are creative and strategic. Let's Connect!